Find out exactly where each visitor is coming from, so you can focus your efforts on what works. Not sure how people are finding your website? Without referral tracking, there’s no way to know which of your marketing efforts are really working – and which are a total waste of time. MonsterInsights makes it easy for you to see exactly where your visitors are coming from. Is your traffic from search engines increasing – or decreasing? Are your social media marketing efforts paying off? Is your paid advertising worth the investment? With this information at your fingertips, you can save time and money as you focus only on what works. According to the 80/20 rule, 80% of your results will come from 20% of your efforts. With MonsterInsights, you can see at a glance which tactics yield 80% of your results. You’ll save time and money by doubling down on what works, and dropping the rest. See your site’s performance at a glance right in your WordPress dashboard. 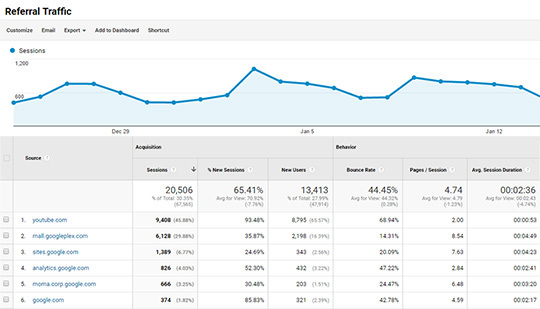 Adjust site speed and sample rate for Google Analytics.